The longer I didn’t update this the more hassle it became but I’ve finally got round to it. Needless to say we are doing terribly and for all our talk are unlikely to finish the season ahead of Lawro, or indeed the Football Guy. He may be a decent pundit after all; still chats a lot of crap though. As always, 30 for a perfect score, 10 for a correct result, -10 for a wrong result. As you can see, pretty poor all round. Let’s look at the breakdown between the two Sportboys. Sportboy P has upped his game and it’s essentially level as he’s predicted one extra match. Personal pride is about all we have left to play for so it will be interesting to see who comes top. 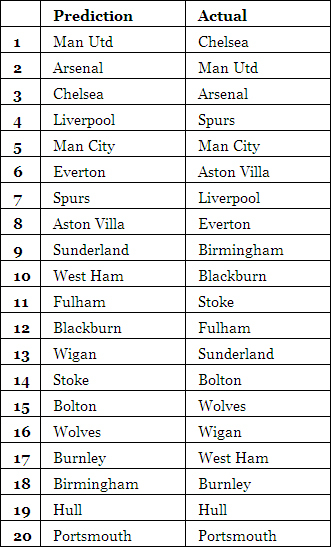 A quick update on our failing attempts to beat Mark Lawrenson at the predictions game. Challenge Lawro Week 15 - Sportboy P brings the score down. Week 16 - Sportboy P once again messes it up. Our first perfect scores in ages that week. Sportboy P was unlucky in that the Sunderland, Spurs and Man Utd games had somewhat unexpected results. Lawro is too lazy to do midweek matches so week 17 was skipped. On to week 18. It’s been a while since I updated Challenge Lawro. For those of you new to this, every week we try and see if we can do better than Mark Lawrenson at predicting the week’s Premier League games. We’re also taking on the Football Guy and at the end of the season we’ll see who’s best. It won’t be Lawro that’s for sure. Simple scoring system: +10 points for a correct result, -10 points for an incorrect result and +30 points for a perfect score. A great week 6 with positive scores in eight of the ten games. An average week 7 but the lead is still good. This week’s scores pre the Monday night match. Here’s hoping Fulham can at least prevent a second consecutive negative score. We’ve had no perfect scores in three gameweeks! Only a quarter of the season gone though. In terms of who’s doing better out of The Sportboys it’s pretty even but my three perfect scores in week 6 have me slightly ahead. I think P might be bang on the money with his Fulham prediction so it may even up tomorrow night. An update on our predictions battle with the Football Guy and the master of all things banal Mark Lawrenson. Challenge Lawro Week 4 results. Challenge Lawro Week 5 scores. A so so week last time round but a couple of perfect results saved a negative score. 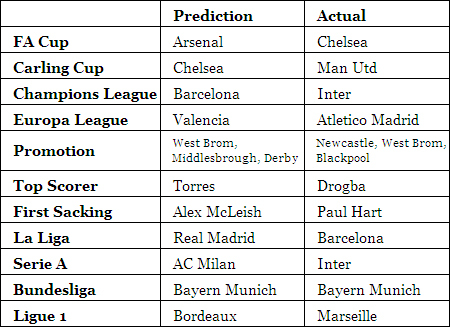 Sportboy P was on a stag do so I had to do all the predictions. I’ve realised that I have six predictions identical to Lawro and three others with the same result so it could be a bad week ahead! Can Lawro & the Football Guy catch up?